I was keeping an eye out for the others, thinking that given the barrel which was the limited range of available pistes that a crossing of paths mights occur… At one point i did see them from a lift, least i think i did, familiar looking jackets, but at i headed back down it became clear that if it was them, they had been heading back toward bars and restaurants and not headed where i was. Even the interesting little black I’d accidentally stumbled upon went from being open and reasonably engaging, to being closed and no right turns, over the course of what was really remarkably very little time. I couldn’t fathom the rational but there was no denying the notable barriers that had been erected in my intended path. They were in a bar, the others, that that was the update i received after the remainder of the lifts made their last run up the mountain. Regathered we made our way down, the last run of the day was the run back to town and although there was an intention to stop of in any bars on the way down that didn’t quite work out. The top of the run actually has a closing time along with a red and green traffic light to denote when your meant to go on through.. We only just made it to the top in time for that but thereafter the speed of the decent presented problems, it was quite rutted and this caused issues for the back markers. It was this speed of decent issue that ultimately put pay to notions of stopping off. Once down and having located Damon, the last to arrive over here who was waiting by the valley station, we went over to the kiosk to buy our evening passes. They were old school, pieces of paper completed with the highly skinny elasticated threads that were once common place. Damon was concerned by the piste, its a red run and he’d been on the blues for his lessons. The piste was not in a good way, especially toward the end, very rutted in places, so while eager to encourage his participation and not see anyone head back to Mayrhofen, the questions deserved forthright responses. Daud, whose approach to such matters is less than forthright but more considered, opted then to head over and ask the people behind the counter about the piste basher and whether it would be doing customary flattening of the pistes pre-night skiing. A much more sound idea, which faltered only upon a language barrier, i rummiged around for my German and managed to ascertain that they would indeed be doing the flattening. So with everyone now in i separated off. It had become clear that earlier intentions to eat at this time were no longer current, so i headed off on a solo mission having half suspected, half hoped, that one of the hut shaped lights in the distance was a Schnitzel burger stand of sorts… The hunger had come, oh yes it had and any further skiing might perhaps be aided by stomach aids. There were multiple bars but most of them had emptied out by the time i headed back to meet up with the others. The bar they were in was similarly emptying out from a not entirely banging starting point. So a migration occurred, a larger bar with big external TV screen flashing out called them hope. The time spent night skiing was limited, the train did not run so very late and after that it was taxis, not everyone was in favor of this and so it was for the train we would head. Oddly though despite the lack of things going on or probably the lack of energy with which to do them and the extensive amount of time we had to burn, we ended up leaving hurriedly to head back over to the now reopened lift. By the time we’d gotten back up to the half way station, the top of the night skiing some things had taken hold, one of these was rain, a developing more than drizzle that just never belongs in a ski resort let alone at the top of a run, there is something very not right about that. The other thing that had happened is a total departure of the legs, this became evident not so very long after as i attempted to ski down. At this point i found my legs had a far stronger memory than I, clearly remembering that all ski holidays were 6 days long ans this was overtime, or as they saw it retirement time though they didn’t seem in full agreement on where they wanted to be going with that time. By the time Charlie and I were back down i was soaked, thankfully wearing waterproofs it was only the outer layer but it pulled of a far shinier look than normal, it was kinda really grim out, not the level of grim that would be anything remarkable or even noteworthy back in the UK but it didn’t belong here. A few decades ago, winter holidays back in Switzerland at still lower altitudes, so very snow abundant was it that my family would regularly build me a little igloo/snow house in the garden. A place to which i was a little irrationally drawn to dwell for cold defying periods of time, while the car needed quite the effort to be dug out. Its really not so long ago in any scheme of things that isn’t viewed from the perspective of the may fly. 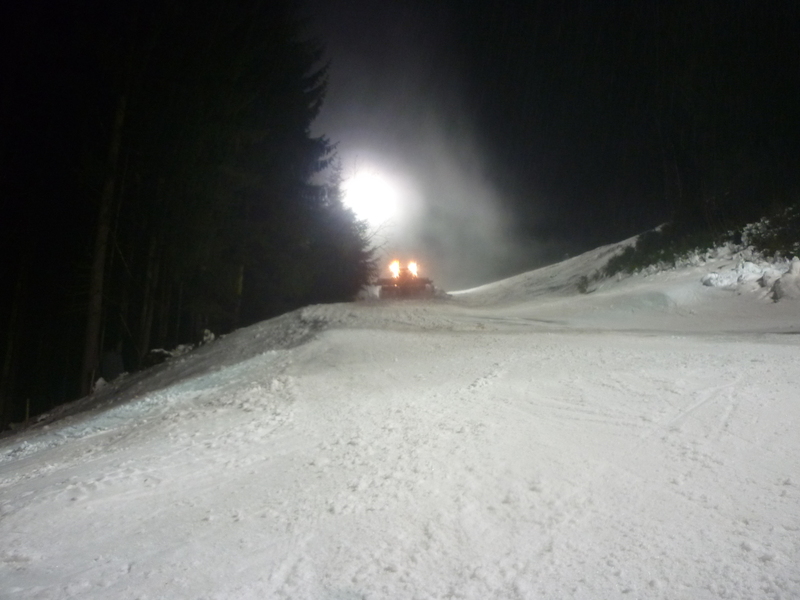 The way down had not been as flat as talk of piste bashers would suggest, certain sections had barley been dusted down at all with the basher seemingly edging up most narrow along one of the sides, leaving the rest largely as it had been earlier. Wherever the others were, our second run began with us setting off in pursuit, we found them on route, Damon was taking it slow, studiously but somewhat stiffly heading down. We stopped off on route, a place we had intended to pause at earlier as part of the skiing down crawl that wasn’t, time had not allowed for it then especially once Damon had arrived, it wouldn’t have done to stop off while other waited at the bottom for our fashionably late entrance. It was a small, octagonal or round, the bar stood at its center. From within we watched the rain descend and heard from the bar staff about how such troubles had been ever more in evidence in recent years. To a tired mind and person who had perhaps come to the point of over familiarity with the generally welcome JaegerTee, this was all a little depressing stuff… by now the missing of the last train had been insured. Besides Damon was of a mind to give it a second go, having made it down the once his personal objective of completing a red this week was behind him. Now he was of a mind to see he couldnt maybe do it again, take what he’d done, what should now be more familiar and do it better. A sort of admiral obstenance applied to a clear ends, there’s something to be said for that, certainly when its set to solid ends. Once more back up and round… Once more into the piste side bar.. On leaving the bad, Milton pointed out the visible grass as we left, grass or rather turf that smeared out where snow had been not long past, when we’d headed in. Then down. There was time for more, the skiing was open until after 9pm but among the group as a whole not the mind for it, dinner was probably coming back into mind. We found a taxi, they loitered most eagerly around the bars and the valley gondola station and headed back, big old people carriers, though surprisingly the price went up as the driver realised there was more of us, enough to all but fill the vehicle.. seemed odd to have some sort of unit price situation going on for a single journey but the difference was small and our options none existent. We’d been up and down over in Hochfuegen any number of times, there are a few runs over there but no more and there number had been reduced by the closure of further lifts, the chairlift we’d been on this morning was now also closed, only the far side of the valley remained open. It seemed a little unnecessary, the weather was far from sever where we were, mind it hadn’t been great up there earlier when we’d come across … so perhaps that didn’t mean so much. In any case it was past midday and there was no sign of things changing. It was time for the unfortunate decision that i had been spending the morning trying to avoid, we would have to be bus bound and make our way gradually back in a manner not befitting of a ski holiday. 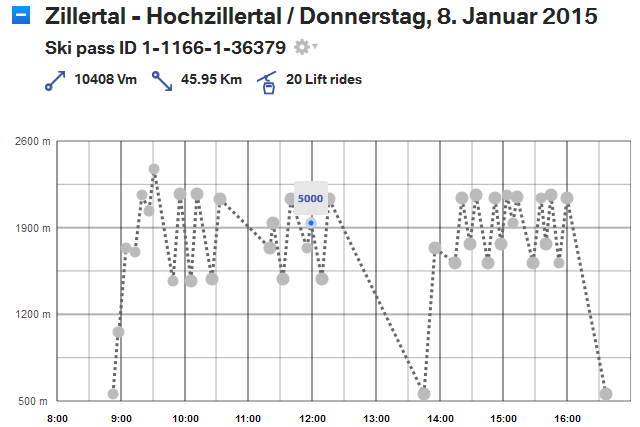 Ski Pass Tracking – It should be noted that the BMW site, went and got the dates confused somehow .. When we found our ride, it conveniently left almost immediately and was far plusher than might be expected, it was too plush for people who were trudging about with ski sticks and boots… i felt a bit like i do when visiting my Aunts pristine flat, the place where nothing it out of place and no dust has ever dared to dwell, like an interloping marauder in land where my merest movement by bring unknown chaos upon it. Something akin to an European frigate, arriving rat laden, at a newly discovered (European perspective wise) and unsuspecting pacific paradise. It was not as quick or as short as all that, the journey but did eventually end up with us back at a train station and further down the valley than i’d had in mind. Optimistic thinking and its perspective altering ways. 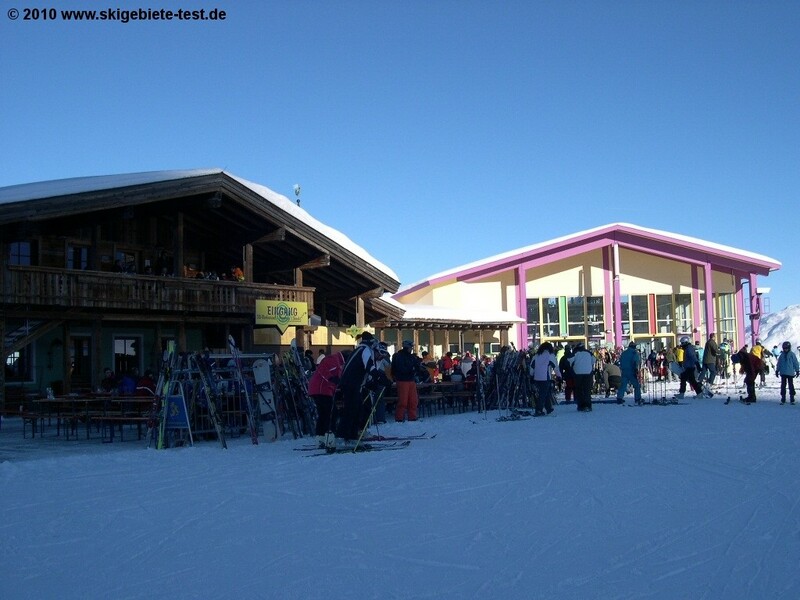 By the time we had re-arrived at Kaltenbach and were headed back up the mornings Gondola, news was that the others were settling back into restaurant life. Its really a wonder that some of them had any encounters with what remained of the snow at all, i passed through gathering up a snickers and visiting the loos, it was about that time. As i headed off for a spot of skiing and the other dined, i found that over here to some of the lifts were shut .. still they all ran largely in parallel and while one was shut its neighbour was handily operational. After all that coach, train and gondola mobiles of elapsed time my legs revealed themselves to be quite seized up, skiing ability was all of sudden unfortunately back to the earlier parts of the week. Still i recovered that somewhat as i headed up and down the gradually overly familiar pistes, the choice having been limited to a few runs down one side of the mountain. At the top is grew gradually greyer and more windy. There is something about a last days skiing that ought to have been reduced down to a second last days skiing or something akin on this holiday, after all we had another half day lined up, a pre-departure last half day.. But there it remained the something about a last days skiing, even when it wasn’t. Daud was staying in Mayrhofen and would join the rest of us in Kalenbach later in the afternoon. 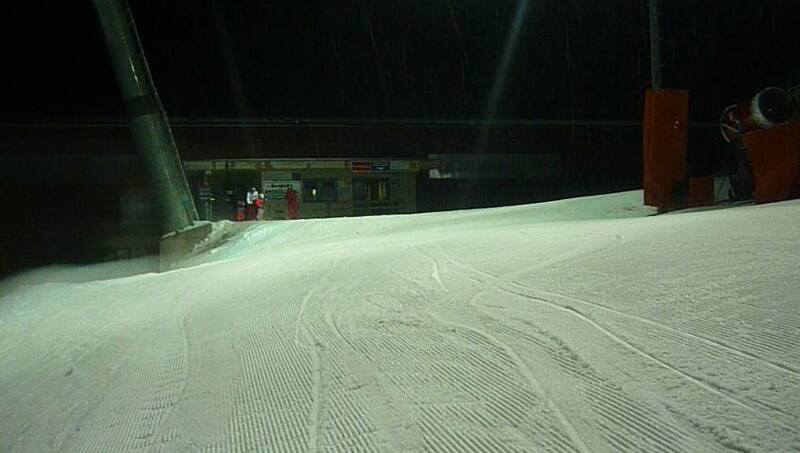 We had a quite deliberate reason for skiing in Kaltenbach today, a Friday. 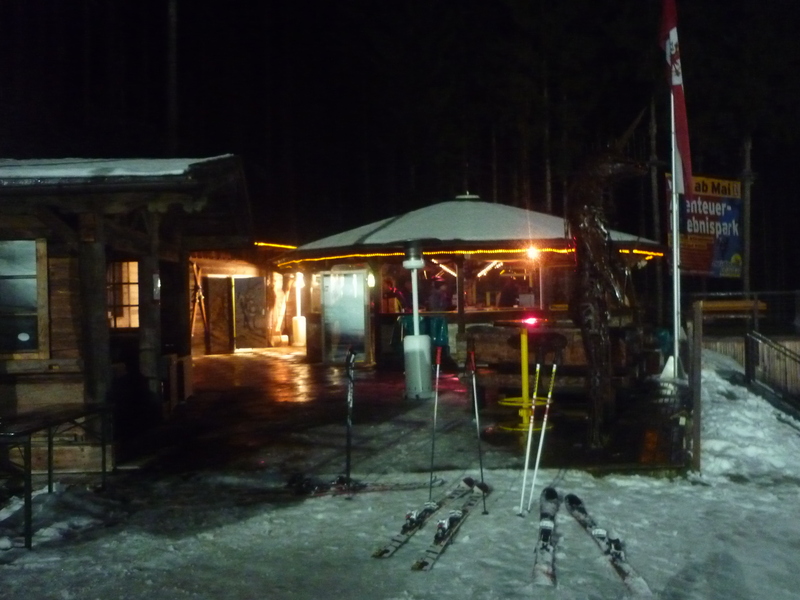 Friday was night skiing day in Kaltenbach, as far as we understood things the only resort to offer night skiing in the valley. We walked to the Gondola station, headed up. There was even talk of fine weather from some as sun cream was dug out and applied. 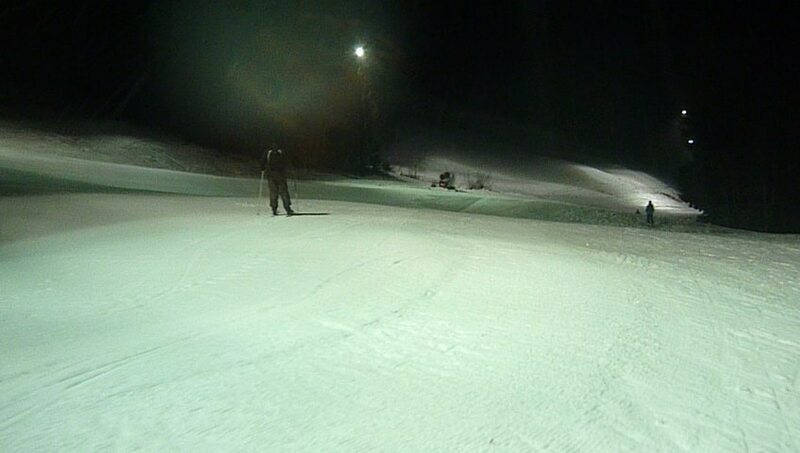 The night skiing was on this side of the valley, on the home run that followed the Gondola down. With that in mind the preference was to head up and over to the other valley earlier, home of the best black run we’d encountered so far, so that we could then return back over here in time for the afternoon, the arrival of others and then, some fair bit later, night skiing. It was not warm at the top, there was no sign of any need for sun cream, the wind was going and it was throwing shards of ice and snow at our faces. This was not quite matters as they had been expected, we tried to study the piste map as the cold whipped about us, twas not a comfortable time, it appeared to be suggesting that the black run was shut. Uncertainty descended, as going the intended direction became more questionable and meant contradicting the wind with its super abundance of mini missiles which it was happily whipping up and launching about the place. Charlie skied down a little, not far but far enough to require walking back up the way and any sort of walking up the way was always viewed most dimly, especially while wearing sliding down the hill planks, which tend to be notably less of an aid for walking back up it. He was looking back up at us as we stood, less warm than once we had been and might choose to be again, with a shrug that may or may not have happened we took of our breaks and set to follow suit. The shards needled my face, more of them, more momentum, thwacking in micro comments attempting to pull of extinction events for any and micro orangism that might be attempting to eek out an existence upon my person, i know not if they are there, if they ought to be there and i care not too know about such matters… i know about the beasties that live in the beds and sleeping places of man and i have to say such knowledge benefits me in few to ways that i can think of and has been placed firmly in the drawer marked things not to ponder upon overly, with a possible additional sub-headed, cant do much about it and well just a little bit minging. Besides biology and related matters was never an area or interest or strength in the before times when learning was more freely attempted or for that matter imposed. Either way the grey, the wind, the cold cold wind and it shards – very nice and very much flying in the contrary direction to the one we were attempting to travel. We didnt have far to travel to where the black run split away to the left, a 90 degree turn of the side of this initial gentle slope, as we got there the wind was already slightly less than it had been moments before, at the top. There was a closed sign and the customary netting but both had been placed to the side of the piste, the sign stood to the side and the netting was rolled and bundled up, leaving the pistes entrance open and utterly unimpeded. This was confusing, a most unclosed sort of look for a piste to be wearing so with a pause and a looking about ourselves in moderate reticence and uncertainty we headed down. It wasn’t the day for loitering, best to opt in or out and go with it, so down the black we went. Turning sideways to the mountain the wind and its missiles were hugely diminished, the sky and world remained grey and quiet but things were much comfier, eyes could be kept open at all times, hands and arms were no longer required to be held aloft to grant the shelter to the face and the piste was actually in a condition far easier to ski than it had been those few days ago. Flatter and generally more uniform under foot, though with more occasional balding or rather notably thinning patches, where white was no longer the resounding colour it was leading with. After skiing about, only a couple of runs worth we headed to the Gondola base station, it was closed, it had a sign suggesting the bus and train as the alternative route back over to the other side..the side from where we’d come. For us it wasnt time to head back yet at any rate, there was the other Gondola, the one to the furthest point rather than back the way. Arriving at the top I took the opportunity to locate one of the attendance, for the purpose of querying the status of the missing link lift, he wasn’t certain on this topic though that was primary a matter of the weather, it depended on the weather, the wind, if it desisted the lift would probably re-open, it was more information than we had before while changing pretty much nothing. We paused in the restaurant at the top of the lift. It took a while but i suddenly noticed they had WIFI, the first real connection with a world beyond our holiday. eMails, replies to some messages id sent for Christmas and New Year… broad spectrum seasonal spamming to the once familiar and past work colleagues, not friends or even frequent familiars such as those here with me. Little else.. I was already aware of the real events of the week, Charlie Hebdo, Daud was never long disconnected and had made us loosely aware of that news, though probably not yet in any detail. The world is full of so many unnecessary evils that we do unto each other, oddly it often one unworthy degrading and monstrous act that will be used as the rational for another. Its astonishing at times how we rush to solace and safety in the darkness to escape the dark and how difficult civilisation if not individuals find it to hold true to it wiser and better judgements. An endless battle against the degrading gravity of our more base, cheap and small instincts, its always there it seems, waiting to take every stronger hold whenever troubles set in, whenever the better intentions would be most tested and of most value they loose their footing, gravity wins and down the snake we go. That’s not exactly the optimism of the moment, these are the reflections of after about a topic barley considered back then. On that day i was on a mountain with low hanging clouds in the company of people who, like myself might struggle to do world improving things but no more than that, things were quiet, relaxed and i had an email from a most amusing and interesting person to digest, a person I’d actually only met the once and briefly. Supplier & work meetings, some time ago – not customarily the place for encountering people at their most interesting or multifaceted, the real life equivalent to the social media of linkedin status updates.